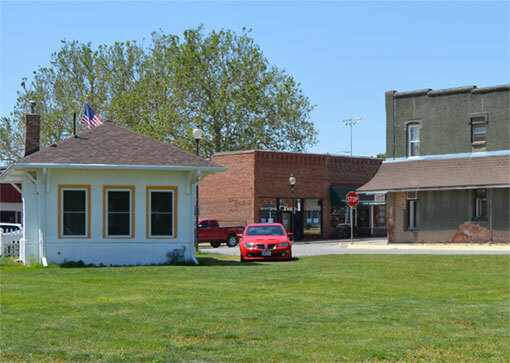 Carlisle (population 3,950) is located in Warren and Polk Counties in central Iowa approximately 15 miles southeast of Des Moines, and is part of the Des Moines-West Des Moines Statistical Area. Iowa Highway 5 runs east-west through Carlisle, connecting with US Highway 65 just west of town. Since the late 1990s the community has experienced steady growth, and counts access to many great parks and trails in the area among its most cherished assets. The focus groups and mail survey results revealed that the ability for pedestrians and cyclists to safely cross Highway 5 in town is a major concern among residents, particularly children going to and from school. These assessments also reinforced the how much residents value Carlisle’s parks and trails. People want to see the trails expanded into the heart of Carlisle and extended to connect to regional trail systems. The concept plan addresses these projects in a number of ways. Entrance enhancements, including signage and vegetation, improve aesthetics while signaling to drivers that they are entering a town. Signage also directs cyclists to downtown Carlisle. Lighting, banners, and native vegetation along Highway 5 through town help to calm traffic. The designers also proposed crosswalks and sidewalk connections along the highway to provide safe routes to school. In terms of trail enhancements, the team created a trail connection from Summerset Trail to downtown and designed a new downtown park that includes a bike hub with cyclist-focused amenities such as fix-it stations. Parks and Trails Are Important in Carlisle! Carlisle’s parks are popular destinations for all user types. Active users reported heavy use of the trails in and around Carlisle, including Summerset Trail and the Scotch Ridge Nature Trail. Iowa Highway 5 is a busy transportation corridor, and focus-group participants were concerned about traffic speed and the lack of pedestrian crossings. They also identified the inconsistent sidewalk system as an issue.